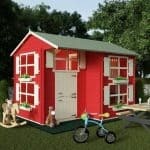 Whether you have children or grandchildren, a playhouse is certain to bring a smile to your face. 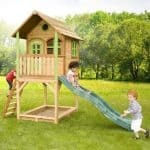 This tower style playhouse from Windsor is sure to delight them, because it’s very attractive and designed to appeal to young eyes and minds. Of course, when they’re happy you’re happy too, and what we found especially reassuring is that they can play in safety because the playhouse has been certified to meet the EN71 toy safety standard. Even the stairs that lead up to the tower are shallow in nature and easy to climb, although of course the little ones will need supervision when using this playhouse. Children will not only be safe when they’re having fun in the playhouse, they’ll be dry too. That’s because this building has excellent weatherproof properties. The first line of defence against rain is the apex roof that sits on top of the playhouse and which carries water harmlessly away. There’s also the high quality tongue and groove cladding used on the walls, which locks tightly together and stops water reaching the interior. If it does rain, your children can still have fun inside and look out through three well sized windows. They feature styrene glazing, which is a form of plastic and so very tough and very safe as well. 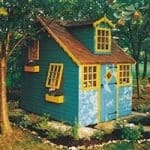 We review playhouses in all shapes and dimensions, and this fits firmly in the mid-size category. We feel it would be perfect for use by two children and maybe with a friend along too. Extra height is given by the apex roof, so even if your kids are taller than average they should still be able to enjoy their new play area. It has a ridge height of 1.96m, and an overall width of 1.56m with an overall depth of 1.88m. These are also the measurements you’ll need to keep in mind when choosing a suitable place in which to position the playhouse. The main play area is the playhouse itself, and its reached by three strong wooden steps on an attached ladder. There’s also a verandah area at the front, although it doesn’t feature a balcony as so many of the tower playhouses we see do. This means that children may climb or jump off the end of it so supervision will be needed. It is a shallow drop, however, and a safety mat could be positioned for this purpose. There isn’t enough room under the tower to stand up in, but we can imagine children enjoying crawling underneath it, or lying there in the shade. One of the features we liked most about this playhouse is its use of shiplap tongue and groove cladding for walls. Not only is it very good at keeping rainwater out, at 12mm thick it feels reassuringly strong. With a standard frame of 28 X 28mm used, the structure as a whole feels stable once assembled. Both the roof and the floor use solid sheet material, which is something that we’re used to seeing on playhouses as it’s more cost effective than using tongue and groove cladding across all surfaces. The floor is a little thinner than the walls, at 8mm, and yet this should still be strong enough to take years of little feet walking and running across it. We always like to see long warranties against rot provided by the manufacturer, as this is very reassuring for the customer and a signifier of how effective the materials used are at keeping rot at bay. 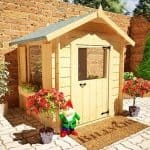 That’s why we were pleased to see a ten year warranty with this playhouse. It should be noted, however, that the timbers have only been given a basic dip coating of preservative, so the warranty is dependent upon the customer treating it themselves on an annual basis. To mitigate any initial expense, a free tub of treatment is provided along with the playhouse, which we think is a generous gesture. What we liked most about the timber door, measuring 0.56m wide by 0.85m high, on this playhouse is its appearance. In the upper centre it has a small round window surrounded by wooden petals, to create a flower effect. It looks very attractive, especially when the sun is shining through it. The glazed panel in the door isn’t the only window, as they in fact feature on three of the sides. We were pleased to find that all the windows, including the smaller one on the door, are made of styrene which means that they are much stronger than standard glass. The effect of all these windows can be especially felt on a sunny day, when the interior is bathed in light and warmth. You’ll know how easy it is for glass windows to break if children are about, but you don’t have to worry about these windows as styrene won’t break or shatter even if a football hits it. It’s a further indicator of how safe this playhouse is, but the sign we welcomed most of all was the EN71 mark showing that it complies with the latest safety regulations relating to children’s toys and play equipment. We have lots of experience in assembling and installing timber playhouses, but if you haven’t then the thought of assembling one can be daunting. That’s why we’re pleased to see that a professional assembly service is available for a cost of £159.99. It means that you’ll be assured of a perfect construction, and so won’t have to worry that you might not have assembled it correctly. There’s also the opportunity to buy tubs of wood stain in either green, red, or two shades of brown. We do recommend that the timber is stained or painted to stop it fading over time, but your youngsters may prefer more vibrant colours so consult them first. 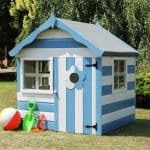 This playhouse has a look of quality, and thankfully a feel of quality too, as demonstrated by the use of shiplap tongue and groove cladding. 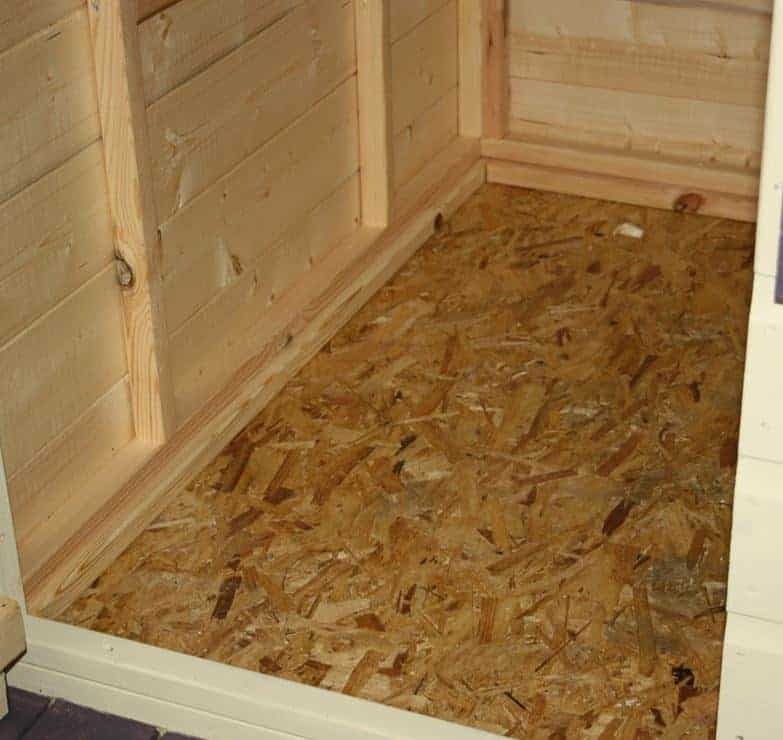 Whilst there is an onus placed on the customer to treat the playhouse with wood preserver every year, the 10 year anti-rot warranty is very reassuring. This playhouse doesn’t take up too much room in a garden, yet there’s still room to fit a beanbag or two and a good selection of toys. With a friend’s help this should be installed in around five hours, although we can imagine many people preferring to opt for the installation service. 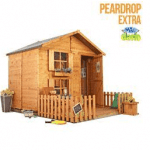 For under three hundred pounds, this is a well made playhouse and the ten year warranty that comes with it is a value adding feature. Final Thoughts: Whether you look after your children or grandchildren, it’s good to get them away from their television or tablet screens from time to time and into their own fun environment. 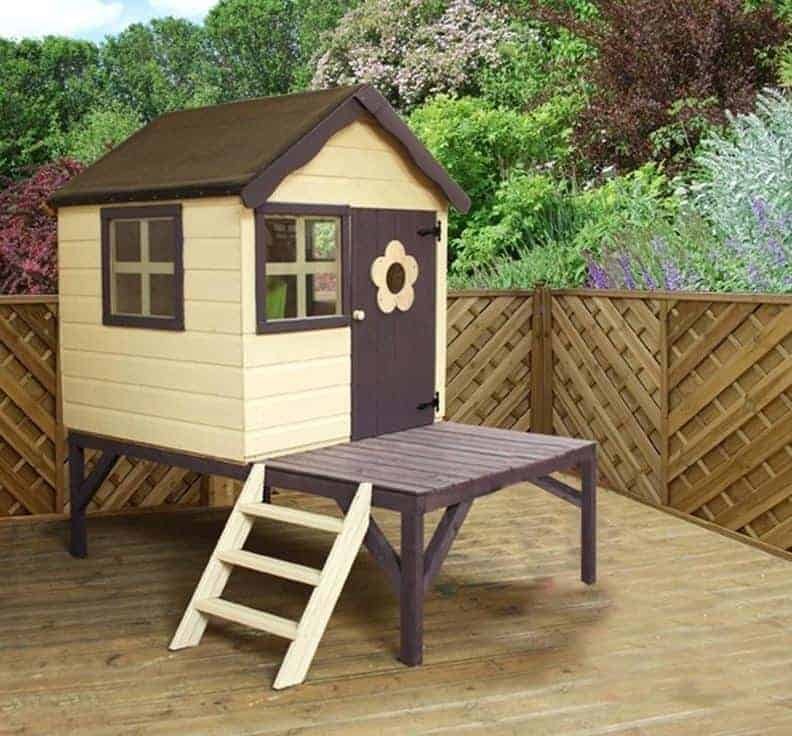 That’s why this tower playhouse can be such an important addition to your garden, as it allows the little folk in your life to play in the way that you did as a child: indulging their imagination, and having a space of their very own. This is one of the most attractive playhouses that we’ve reviewed, and we particularly liked the flower window on the door, so it’s sure to be a hit with children aged three and above.